In order to determine his future, he must piece together his past, navigating an unsympathetic society toward revealing the novel's philosophical heartbeat. A character study of surreal wit, Mr. Turtle delivers action and insight, all the while crafting an homage to its chosen genre unlike any other. 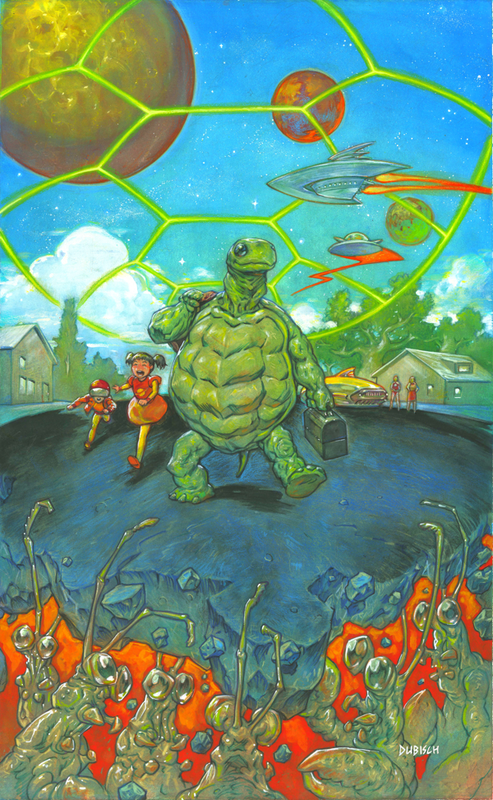 ...a cyborg turtle in a near-future Japan, where creatures like him are tolerated but never truly accepted. Mr. Turtle himself never speaks; our access to his mind is through the close third-person, and this accentuates the loneliness that permeates the story. Kitano loves layers, and there are many to upturn in this deceptive tale of a cyborg turtle’s existential awakening. ... It’s hard to think of a similar story about artificial intelligence that is as deceptively simple. Deceptively simple fable-like animal tale takes some mind-bending turns and leaves you wanting more. Kame-kun is one of the most endearing characters you’ll come across in speculative fiction... and he never says a word. Reserved, polite, uncertain, haunted—Kame-kun is all of these things because he is out of place on so many levels. [...]Kitano’s writing style is addictive—measured, controlled, but with an ebullience just simmering under the surface. Kame-kun—sentient being ? thinking machine ? —has his own existential identity crisis, the fundamental question of: "Why am I a turtle ?" gnawing at him. ...a curious existential-technological work. There's quite a bit of charm to the novel, and a darker serious side lurking below. ...an agreeably odd read. Rachel Cordasco, of the Speculative Fiction in Translation website, recently posted a short interview with Mr. Grillo, discussing Mr. Turtle and other things. Now available as an e-book from major etailers including Amazon US, Amazon Japan, B&N Nook, Kobo, and Apple iBook. Yusaku Kitano (北野 勇作; 1962—) won the 4th Japan Fantasy Novel Grand Prize in 1992 with Mukashi, Kasei no atta basho (Where Mars Used to Be), and has won a devoted following in the SF community for his examinations of a range of social and personal issues, all cleverly cloaked in humor and gentle storylines. Tyran Grillo’s passion for East Asian languages began in high school, when he encountered Japanese popular (and not so popular) music. Once he began his studies at the University of Massachusetts Amherst, where he earned both his B.A. and M.A. in Japanese Language and Literature, an interest in song lyrics developed into an even more intense love of poetry and literature. A desire to translate was always at the heart of these endeavors and led him to publish two translations—Hideaki Sena’s Parasite Eve and Koji Suzuki’s Paradise—with Vertical while still an undergraduate, followed by Taku Ashibe’s Murder in the Red Chamber (Kurodahan Press). Most recently, he has published translations of novels from Yoshiki Tanaka’s seminal Legend of the Galactic Heroes series with Haikasoru. He currently lives in New York City, teaching as a postdoctoral fellow at Columbia University, having completed his Ph.D. in Japanese Literature at Cornell University in 2017.